*Available online and in-store. In-store offer is December 18, 2018 - December 22, 2018. See sales associate for store details. 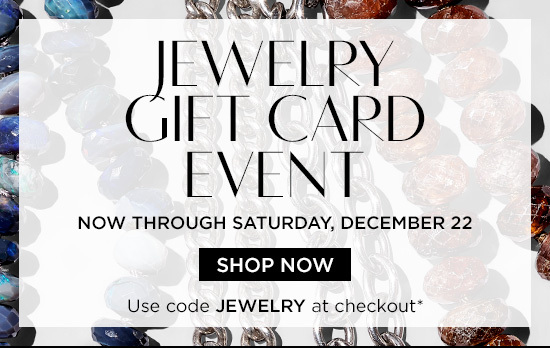 Online Promotional Gift Card Details: When can I use: Use code JEWELRY online at checkout before December 23, 2018 at 9:00 AM CT. Where can I use it: Domestic online orders only Promotional Gift Card Offer: The value of your select regular-priced order must total $2,500 before shipping, tax, and gift packaging. Receive $300 when you spend $2,500-$4,999; Receive $600 when you spend $5,000-$9,999; Receive $1,200 when you spend $10,000-$14,999; Receive $2,500 when you spend $15,000 or more. Your promotional gift card and redemption instructions will be sent within 8 weeks of the promotion expiration date via the email that was used when placing the order, and expires within two months of the issue date, and will be indicated on the award email. We recommend adding bergdorf@bergdorfgoodmanemail.com to your contact list. Qualifying items will be marked on the site with an indication in green font on their product page. Canceled orders do not qualify. By participating in this promotional gift card event, you agree to have your award emailed to you via the email address provided when placing your order. Exclusions: Not valid on prior purchases, BG Gift Cards®, catalog orders, Neiman Marcus®, Last Call®, or CUSP®. International orders do not qualify One gift card per customer is allowed; amounts spent above the qualified level will not apply. Offer cannot be combined with other gift card offers. Select designers excluded. Qualifying items will be marked on the site with an indication in green font on their product page. For further assistance, please call 1.800.944.9888. Bergdorf Goodman employees are not eligible for this offer. What happens if I return merchandise: Applicable returns will be subtracted from the qualified submitted sales, and any gift card earned may be forfeited or the value reduced. *Rush shipping offer not valid in stores. To receive free overnight delivery, enter the promo code BGRUSH in the promotion code box in your shopping bag during checkout. Adding gift packaging may delay the shipping of your order. Hazardous items including alcohol-based products such as fragrances are required to ship via ground transportation and are not eligible for overnight shipping. A signature may be required on some deliveries. Valid on eligible Internet orders of in-stock merchandise only. Does not apply to the BG Gift Card®, items shipped directly from the manufacturer, oversized items such as furniture, items that state "Delivery & Processing Only" or items that include additional delivery and processing charges. Additional shipping and "shipping only"charges reflected on selected product pages will still apply. PO Boxes and select ZIP codes are not eligible. This offer cannot be applied to previous purchases. Canadian orders are not guaranteed rush delivery and will still be subject to all applicable duties, fees, and taxes. International orders do not qualify. Exclusions may apply. Offer expires 12/22/18 at NOON CT.